Youth Advisory Committee Needs Your Help! The Grundy Area Vocational Center’s Criminal Justice II class has been working with the Behavioral Health Alliance of Grundy County as the BHA’s Youth Advisory Committee to address the opioid overdose epidemic. The class includes seniors from Morris, Minooka, and Gardner-South Wilmington High Schools. Please complete the survey even if you did a similar survey last December. This year’s survey will be used to measure changes since last year in the amount of community knowledge and support for Takeback programs. It also contains an additional question about addiction. If you would like to review last year’s survey results, you can download the YAC Takeback Survey Report. Illinois’s new opioid misuse prevention campaign is underway, working to educate residents about the responsible use and safe disposal of medications. It’s called Guard and Discard. 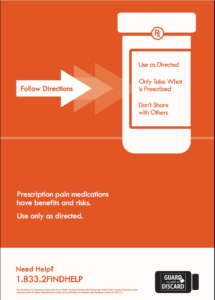 The current message focuses on the safe use, storage, and disposal of medications. The message also showcases the statewide addiction helpline: 1-833-2FINDHELP. Taking a drug not intended for you—or one taken by your child accidentally—could result in a trip to the emergency room. Using medication beyond its expiration date may not be effective. Someone in your family or someone else who spends time at your home could be tempted to misuse certain drugs to develop and/or feed an addiction. This is especially true for certain commonly abused opioid painkillers (Vicodin, Oxycontin, Percocet, etc. ), depressants (Xanax, Valium, etc. ), and stimulants (Adderall, Ritalin, etc.). It’s important to go through your cabinets to periodically remove old and unneeded medications of all kinds—prescriptions, over-the-counter medicines, and other medicated products such as inhalers and ointments. Pack them up and bring them to a local drug takeback program. In addition to medications, sharps will be accepted in approved containers by the Coroner’s Office and Coal City Police Department. You can get more information by downloading the Grundy County Coroner Take Back Brochure or by calling the Coroner’s Office at 815-942-3792. One part of the project is to gather information on medication disposal behaviors of Grundy County residents to help gauge the need for increased disposal options and community education. The students chose to implement a survey in an effort to obtain as much input from the community as possible. A total of 439 people responded to the survey and gave input showing that most of them did not know about the take-back bins available in Coal City, Minooka, and Morris. 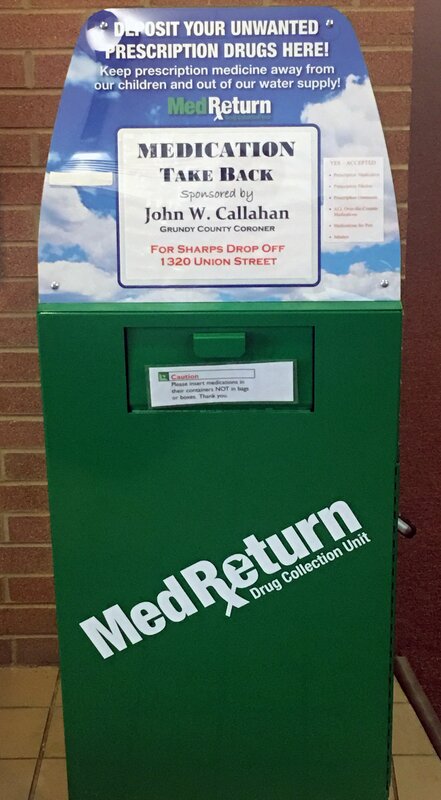 It also showed a strong support in the community for safe disposal of medications. If you would like to know more, please download the YAC Takeback Survey Report.